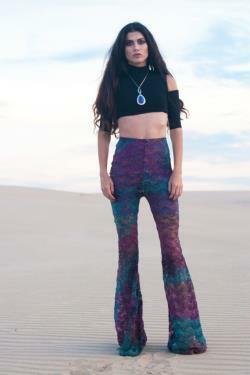 Made to your size bellbottom pants in a unique tie dye blue and purple stretch lace pants are lined in a purple fabric from mid thigh up, the rest of the pants are left sheer. High waist cut with wide flare. This lace is a floral print with horizontal ribbons in a zig zag pattern, ribbon also has metallic detailing (click "zoom" on first image, the metallic areas are visible). 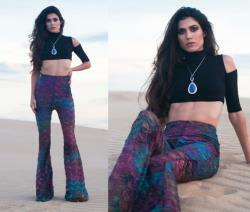 Very unique fabric and perfect for lovers of bohemian style. \\\\\\\\\\\\\\\\how to order a custom pair. Please please please measure very carefully i cannot take responsibility if given incorrect measurements that should affect fit of the pants. -desired inseam, please also include your height and shoe heel height. Measurement key can be viewed here for details on how to measure.